Masonry works well under way at Marischal College. LTM are now well underway with the combined Masonry, Masonry Repair and Stone Cleaning contracts with Sir Robert McAlpine on Marischal College, Aberdeen. 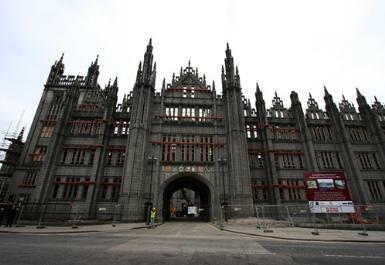 This iconic building which is the second largest Granite building in Europe is in the process of having its grand façade restored back to its former glory as part of a larger renovation project which set to form the new offices for Aberdeen City Council. This 66 week contract involves 20 Masons undertaking various complex structural works including pinnacle, façade rebuilding, new sandstone tracery windows and 100% re-pointing and repair over 15,000sq.m of masonry.